ARE YOU AN INDIVIDUAL CONCERNED ABOUT YOUR ONLINE REPUTATION? There is finally an affordable and effective online reputation management solution designed specifically for individuals. Hiring an agency to clean up your online reputation can cost thousands of dollars, but Osculteo lets you take control for just a fraction of that. Quickly and easily diagnose and monitor your results or request the removal of negative links. ONLINE REPUTATION MANAGEMENT MONITORING MADE EASY. Why spend hours trying to monitor your Google results when Osculteo can do it for you? When your search results change you will get an email notification letting you know if you need to act. If you do, we can help. 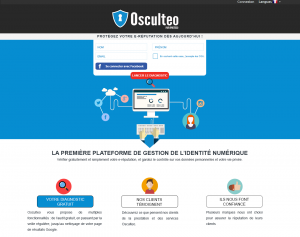 Osculteo also protects your personal information. Using the privacy mode, you can check if your credit card number, phone number or other private information appears online and if it is publicly associated with your name. You can ever set up monitoring on these pieces of information. If they are ever posted online, you will know and we can act. You can also review photos of yourself on Facebook and find where to delete and untag them. (Brad Pitt online reputation) Your audit includes a word cloud highlighting important results associated with your online reputation. See what others are saying about you in just a glance. DO YOU NEED SOME NEGATIVE RESULTS CLEANED UP? WE CAN DELETE THEM! With one click, forward the negative result to our team. We will review it and promptly get back to you a price quote to have it removed. As reputation management experts, we intervene on multiple levels to remove negative content. We identify content creators, editors, web hosts and search engines. We approach them on your behalf to ask or negotiate the editing, deletion or delisting of negative content. When necessary our legal team issues formal take-down requests. Content removal requests start at just 49€. Get your free reputation audit.